Colombia says the number of Venezuelans fleeing a severe economic crisis to live in Colombia has increased by 62% in the last six months. Migration officials say more than 550,000 Venezuelans are now living in Colombia, mostly illegally. The influx is putting pressure on the government especially in border areas to provide the migrants with food, shelter and medical care. The number of Venezuelans travelling through Colombia has doubled. 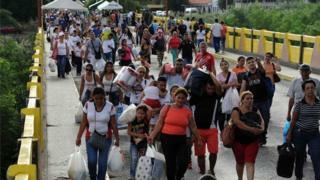 Officials say a million Venezuelans have registered for a migration card that allows them to come and go across the border to buy food and other products scarce in their own country. On an average day in 2017, more than 30,000 Venezuelans used the card to enter and leave Colombia across a border where smugglers thrive selling increasingly unavailable but heavily subsidised Venezuelan products to Colombians. Of the Venezuelans living in Colombia, 126,000 have legal permission to stay including some 69,000 who have taken advantage of a humanitarian visa introduced in July. Last week, UN Secretary General Antonio Guterres said the UN was willing to send more aid to Colombia to help with the growing influx of migrants.